It's 92 degrees in the shade, 89 in the living room, and still several more hours until sundown. The sheep are lounging on the cool ground by the spring, the chickens are standing around panting, and there are cats sprawled out everywhere. I keep telling myself that all this sweating has got to be detoxifying. 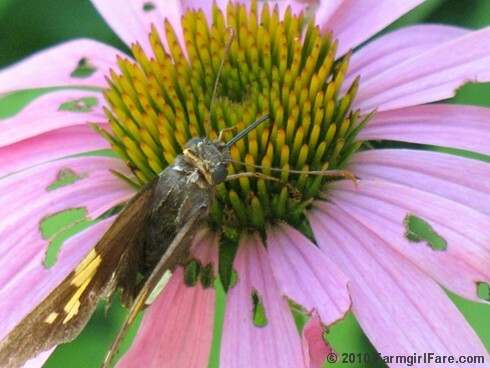 Nobody wants to move—except for the moths and butterflies. 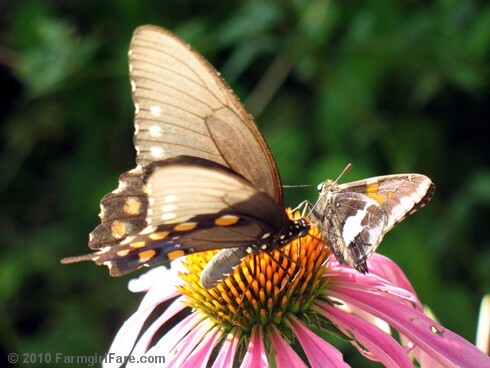 They're over on the echinacea, excitedly fluttering from flower to flower as fast as their little wings will let them. It's an exhausting but beautiful sight. 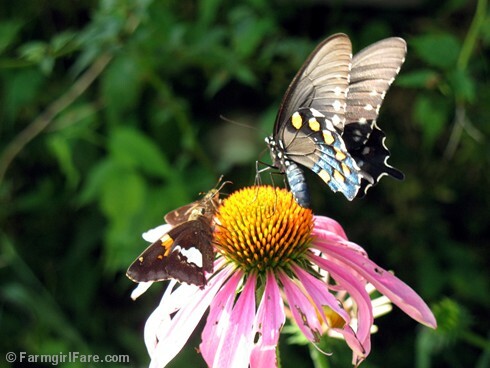 I love echinacea, also known as purple coneflower, almost as I love seeing all those pollinators. 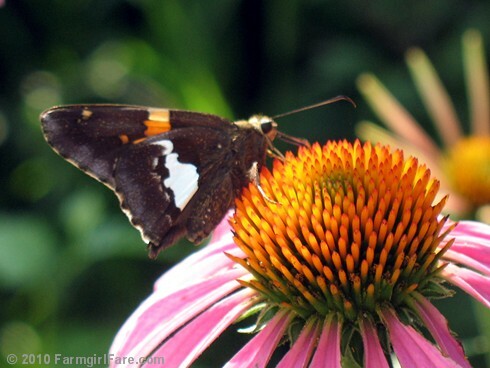 Last June I wrote about echinacea in this post, declaring it to be one of my favorite flowering perennials and touting it as easy to grow, no maintenance, heat loving, drought tolerant, long blooming, self seeding, pollinator attracting, poor soil loving, insect resistant, cold tolerant, and pretty much impossible to kill. Yep, that about sums it up. Once you get your echinacea growing (it loves full sun), it should basically take care of itself, reseeding and gradually spreading as the years go by if you let it. I started with a couple of plants that I dug up and brought with me when I moved here ten years ago, and I now have a patch of echinacea that covers about 40 square feet. 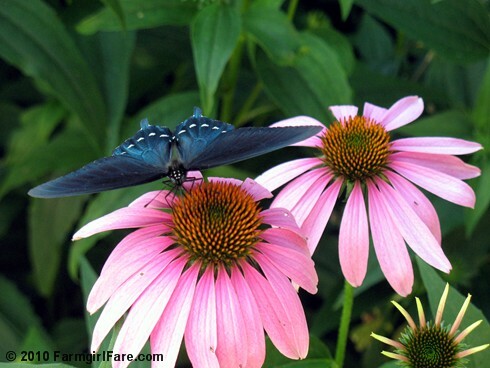 I did learn last summer that echinacea isn't totally insect resistant, when the Japanese beetles came out in force and attacked it, as well as just about everything else in the garden. They eat something like 270 different types of plants. I'd never seen a Japanese beetle here until two years ago, when we had an unusually rainy spring, which was great for the hayfield and pastures but caused a lot of bizarre things to happen in the garden. We had a fairly wet spring this year, too, and I saw the first Japanese beetle of the season yesterday while I was snapping these pictures. You can see that many of the flowers already have bites taken out of them. Maybe those moths and butterflies know it's probably now or never. 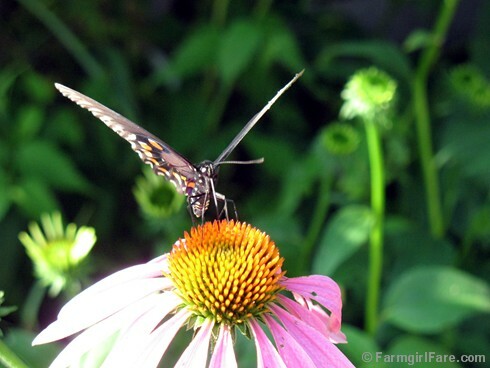 6/22/10 Update: I just posted some more echinacea pollinator pics on Farmgirl Fare I like even more than these. Click here if you'd like to see them. 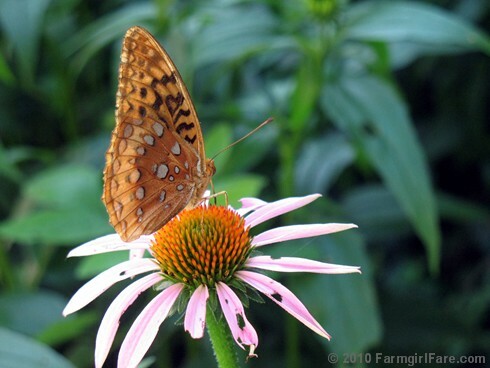 Do you have any echinacea growing tips, stories, or memories to share? 6/24/09: My Favorite Easy to Grow, No Maintenance, Heat Loving, Drought Tolerant, Long Blooming Flowering Perennial? Echinacea! © FarmgirlFare.com, the pretty in pink foodie farm blog where I'm seriously thinking about having ice cream for dinner. 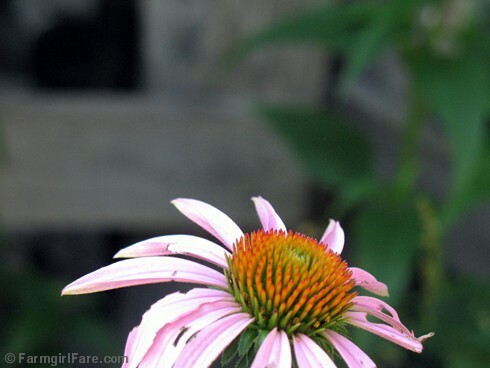 I planted echinacea last year and have yet to get any blooms... I'm hoping it will come back next year and bloom. Your pics are lovely! My Coneflowers are getting close to blooming and I can't wait! Definitely one of the best flowers! Hey if it will attract those butterflies I'm going to have to plant some. Gorgeous photos as usual. Nothing wrong with ice cream for dinner. We basically had lettuce and strawberry milkshakes for dinner last night. Great photos!!! Thank You for adding some color to my day!! 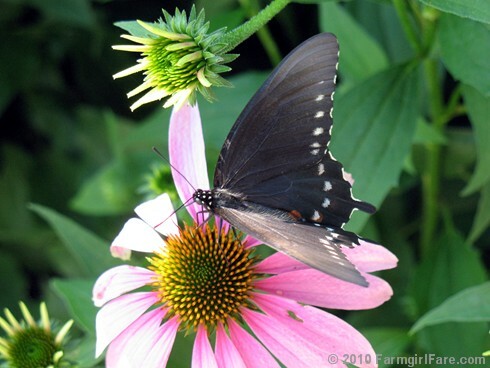 I really enjoyed this article on the cone flower, I paint butterflies and flowers and I often use the draw of the coneflower to capture photos of butterflies to paint later. Hi! I came from Japan. Forgive my clumsy English please. I wrote a comment because your photos are very beautiful. I'm interested in gardening and the cultivation of vegetables, too. I cultivate a carrot in the veranda of the apartment. I planted seeds in the garden planter. Now the foliage growing up.